FRANK FERRIS, the unfortunate man who is condemned to be executed to-day for the murder of his wife, has been positively refused a further respite by GOV. FENTON. No efforts have been spared by the Portuguese Minister, or Mr. Kintzing, his counsel, to secure a commutation of sentence to imprisonment for life. Both these gentlemen have personally importuned the Governor, but without avail, as he yesterday declared, for the last time, that he could see no reason for clemency in this case. The murder of which FERRIS was convicted was committed on the night of the 9th of September, 1964, and seems to have been as deliberate as it was horrible. After having announced his purpose, he went to the room occupied by his wife, and after breaking in the door with an ax, beat her brains out with the same instrument. He was arrested by the side of his victim, with the murderous weapon in his hand. He was formally indicted, tried, and, on conviction, sentenced to be hanged in April last. The case was appealed, and after a review of the proceedings he was resentenced. A respite was granted form the 17th of August until to-day, when the execution will take place. FERRIS has been a very troublesome prisoner during his incarceration, his querulous and jealous disposition occasioning the keepers much trouble. He found fault with everybody and everything that came near him — the physicians, the keepers, his counsel, his friends, his food and his accommodation, and even so late as yesterday, repeated to our reporter the long list of fictitious grievances which have troubled his mind so much. His nature seemed to be devoid of gratitude, and for all the favors gratuitously heaped upon him by the representatives of his country, his counsel and the prison officials, he has had no word of thanks, but rather of censure. Although he has been carefully examined by experts in reference to his sanity, and pronounced a responsible person, there are certain points upon which his perverseness would seem to amount to insanity. He says that he has forgiven all his enemies and is prepared to die, yet speaks with great bitterness regarding some of the witnesses who testified against him, and persons who have been of service to him since his arrest. Twice since his sentence was pronounced he has been deprived of the means of self-destruction. Once he made a great fuss because he had no looking glass. One was furnished him, and shortly afterward a quantity of strychnine was found concealed between the glass and the frame. Subsequently an apple was found in his cell stuck full of matches. Matches had been furnished him for lighting his pipe, and he had stuck the ends of these, which contained the phosphorous and brimstone, into an apple, doubtless intending, when a sufficient supply of the poison was obtained, to eat the apple. FERRIS had been attended constantly of late by Fathers DURANQUET and MCKENNA, who have endeavored to prepare him for his fate. While he talks fairly upon religious subjects, it is evident from the manner in which he converses upon other subjects, that his thoughts are “of the world worldly.” He appears in good health, is strong and vigorous, and says he will walk manfully to his death. He did contemplate making a speech under the scaffold, but at the instance of his spiritual advisers has relinquished the idea. All the preparations for the execution are completed. The gallows — on which GONZALES and PELLICIER were hung last Friday — was erected yesterday, and the usual preliminaries arranged. During the erection of the gallows, FERRIS was removed from the condemned end of the first floor of the prison to one in the second corridor, where the sound of the carpenter’s hammer could not reach his ears. The execution will take place around 10 o’clock to-day. 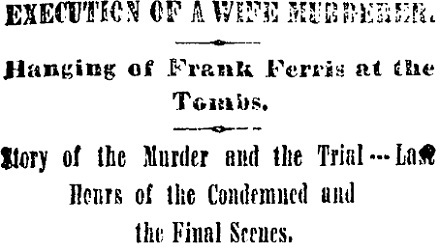 FRANK FERRIS, alias FRANCISCO FERREIRA, was executed yesterday morning at the Tombs for the murder of his wife, MARY FERRIS, on the night of Sept. 9, 1864. The murderer was a Portuguese, 36 years of age, and was a sea-faring man. His victim was an Irish woman, the mother of three children, two of them by a former husband. FERRIS was an intemperate man, of violent temper, and often had severe quarrels with his wife. Instead of contributing to the support of his wife and children, FERRIS squandered in drink the money earned by his wife by washing and ironing. He enlisted as a private soldier in a Massachusetts regiment early in 186, but after a few months’ service was discharged for disability. He returned to New York, resuming his old habits, and his wife refused to live with him. He became jealous, and in his drunken frenzy frequently threatened to take her life. Unfortunately those threats were not heeded, and the brutal murder was committed. MARY FERRIS, the wife of FRANK FERRIS, occupied the top floor of the tenement-house, No. 31 James-street. She was living with her children apart from her husband. She is spoken of by some as a hard-working, industrious, patient woman. Others alleged, and her husband among their number, that she was a prostitute and a disorderly character. No evidence of this kind, however, was adduced at the trial, but a good character was given her. Her husband had been striving to insinuate himself into her lodgings for weeks, and on her refusal to live with him, had beaten her repeatedly. But a short time before the murder he had assaulted her with an ax, and inflicted such wounds upon her that her life was despaired of. At the instance of her friends she procured the arrest of her husband, and on her complaint he was sentenced to the Penitentiary. He also swore that he would kill himself. When asked what would become of his children, he replied that they could go on the island. He was observed during the day sharpening a knife on the curbstone in front of the house in which his wife lived. When MRS. FERRIS returned from her work she was informed of the threats made by her husband, and, yielding to the entreaties of her friends, she removed her children and some of her things to the room of a neighbor on a lower floor of the building, where she gave the children supper and put them to bed, intending to remain there with them. Yesterday morning about 200 persons gathered within the walls of the prison to witness the execution. Capt. JOURDAN, of the Sixth precinct, was in attendance with a force of 150 policemen, for the purpose of preserving order within and without the prison. The clergymen were saying the last prayers in company with the prisoner in his cell as the spectators were assembling. Sheriff KELLY was with him also most of the morning, and superintended his dressing for the scaffold. The fatal cord was adjusted about his neck, and the black cap was fitted to his head by Mr. GEORGE ISAACS, upon whom the duty of executioner devolves. FERRIS then bade good bye to all present, and everything being in readiness the solemn procession moved toward the gallows, FERRIS walking between Sheriff KELLY and Mr. ISAACS, preceded by the clergymen. As they emerged from the cell the condemned man began singing, in a clear and distinct voice, a Portuguese hymn, usually sung by his countrymen when the holy sacrament is being given to a dying man. He continued singing as he walked through the line of spectators, concluding the hymn as he took his place beneath the gallows. My Dear Gentlemen: I am going to die, and I am innocent of the crime for which I suffer. I do not mean I did not do it, but, though my hand is guilty, my heart is innocent. But for Father DURANQUET and the good Sisters of Mercy, I would have had more to say, and give an account of some people. Good bye, my dear brothers — Amen. He then thanked Sheriff KELLY for his kindness to him, and resumed his position under the rope. Mr. ISAACS then pulled the black cap over his face, adjusted the rope which was around his neck to that dangling from the beam and all was ready. The Sheriff, with his handkerchief, gave the signal, and with the fall of the heavy weights behind the screen, the body of FRANK FERRIS was drawn into the air. There were a few spasmodic twitchings of the limbs, a convulsive clutching of the hands, and then all was quiet. It was just 9 o’clock and 50 minutes when the weights fell, and in fifteen minutes pulsation had ceased. The body was partially lowered and examined by several physicians, and a few minutes later was taken down and deposited in a plain coffin. The body of FERRIS is to be buried in Calvary Cemetery, the Portuguese Consul having made arrangements to that effect, and defraying the expenses of burial. The orphan children of FRANK FERRIS and his murdered wife have been cared for by the Catholic charitable institutions of the City. The Sisters of Mercy have taken the two girls, and the Brothers of Mercy the little crippled boy. The injury to this child was received after the incarceration of the father, and while in the care of Mrs. FERRIS’ sister. The father manifested much affection for the boy, and not till recently, if ever, forgave his sister-in-law for her carelessness in permitting the child to fall out of a window.